Since 2016 AXCENTIVE are engaged into a Corporate Social Responsibility program. After a first evaluation of the strengths and weaknesses, the decision was made to benchmark our current CSR behaviour by allying with the Ecovadis initiative. This collaborative platform originating from Europe has gone global since its establishment in 2007 and now counts over 35,000 customers in 120 countries and many of those are from the chemical industry. Ecovadis is offering online tools and support to objectively check the level of Socially Responsible behaviour including environmental, social, ethical and supply chain aspects. The evaluation is based on a review of questionnaires and documentary evidence. A first dossier was submitted in October 2017 and Axcentive had obtained a bronze medal. Several axes of improvement were suggested on which the Axcentive team worked actively to submit an updated dossier in October 2018. 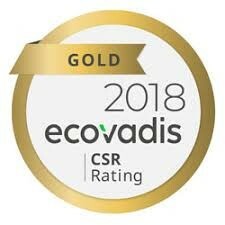 We are proud to announce that Ecovadis has now granted Axcentive with a Gold medal for its Corporate Social Responsibility.